Schaumburg, IL, September 11, 2017 – New for knobcon 2017 (https://www.knobcon.com/), 1010music LLC (http://www.1010music.com) announced the availability of synthbox. This new polyphonic Eurorack module lets anyone simply connect a MIDI controller and start jamming immediately with 50 jaw-dropping sound presets. Then for the ultimate in tonal tweakability, the built-in touchscreen provides total control for choosing and shaping waveforms, adjusting envelopes, adding modulation, applying filters, effects and composing with step sequencers. In addition, hard-wired CV inputs and external clock or MIDI sync allow easy interfacing with other Eurorack modules. With an expandable library of 100 wavetables, high-quality 24-bit audio path, and versatile control – synthbox will feed hours of synthetic, sonic satisfaction. 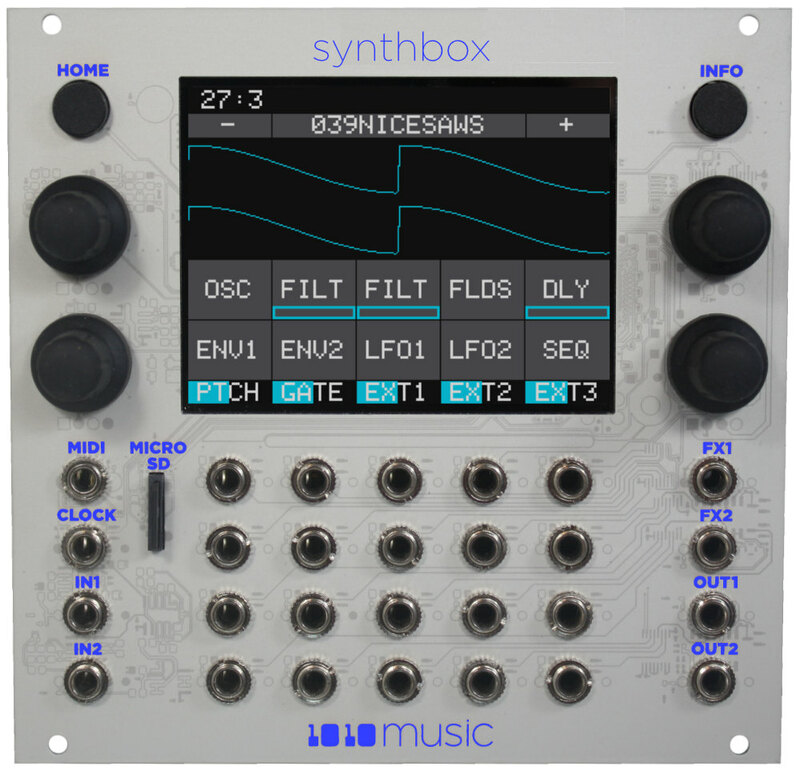 See and hear more about synthbox in this video (https://www.youtube.com/watch?v=0lZ6guXMKNg) New units can be purchased for $599.95 directly from 1010music or through a fine network of dealers that you can find at 1010music.com. synthbox is also available as a free firmware upgrade for bitbox and fxbox owners using microSD card and downloads available to registered forum users at forum.1010music.com. For user or dealer inquiries please contact sales@1010music.com and for review and press inquiries, please contact marketing@1010music.com. A high resolution image is available for download.